Laguna Breeze is a small residential development approximately 1 mile down Fort Morgan Road. The complex is made up of two 2-story buildings each holding 4 units. All units are 2 bedroom/2 bath floor plans with an average of 1,000 square of living space. Condos are well-appointed with nice furnishings such as granite counters, stainless steel appliances, custom cabinetry, jetted tubs, and tile flooring. The property offers a gated outdoor pool, grilling area, bike rack, and onsite parking. Nature lovers can visit the Bon Secour Wildlife Refuge next tot the community and enjoy several walking and biking trails close by. Further west on Fort Morgan are several championship golf courses, such as Kiva Dunes and The Peninsula Golf & Racquet Club. 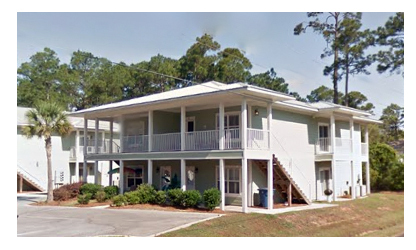 Laguna Breeze is about 5 minutes from Gulf Shores public beaches, popular entertainment venues and restaurants. Please let us know if you would like further info for Laguna Breeze or any other Gulf Shores condos, homes, or real estate along the Gulf Coast or would like to schedule a private viewing by emailing info@condoinvestment.com or by calling (251) Area-Pro (251-273-2776) for immediate assistance.